So i just found something on X Legacy Collection of X6. Apparently there are 2 voices i didn't recognize on X Folder. Have you guys ever found this voice before? No idea, but if you happen to find them in-game (in the japanese PS1 version) let me know, as I'm still not sure I covered all of the missing voice clips. How's this for the green Hunter's portrait? To me, it feels like I did a slightly better job than with the magenta one. 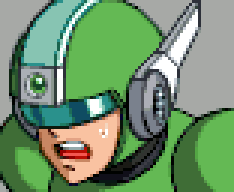 Again, I had to interpret the area in the front of the helmet with the gem, since the sprite has a weird pattern there, partly consisting of a bright green color, seemingly indicating a gem, but the shape is weird so I just used a round shape. Looks awesome! I really don't know what to make of either of the original sprites' gem areas, that had to be annoying. I like the square-to-gem ratio on Green much more than Magenta too, nice change. I got to thinking, your interpretation really reminds me of a headlamp, especially for Magenta since the light?/line looks like a strap, which is really cool because that would be a perfect Reploid type to scout the ruins, until D-1000 starts rampaging. I just dumped a big chunk of the code that reads and assigns mugshots. I'm off to dissecting it and figuring out how it works, and hopefully how to expand it. Wish me luck! And if I don't report for a several days, don't call the cops. It might take awhile. [...] I wonder if there was an option to remove the Japanese dub in anyway or a possible English dub of sorts. Obviously, the latter would take a ridiculous amount of effort, but hey, maybe acediez wants to or something. I'm still curious about this. I might need to tweak the lower lip between frames for continuity, but I think I'll just basically keep it like this to save me the effort of drawing the mouth from scratch. Definitely looks better than my magenta Hunter portrait. I had trouble getting that one's helmet looking good. No clue on that, since I don't remember the voices well. On the topic of that, I wonder if there was an option to remove the Japanese dub in anyway or a possible English dub of sorts. Obviously, the latter would take a ridiculous amount of effort, but hey, maybe acediez wants to or something. There's a Demo Voice > off option in the option menu of the original game (English/Western version) which removed the Japanese voice in dubbed dialogue sequence and sort. And he can't find who caused this." Definitely looks better than my magenta Hunter portrait. I had trouble getting that one's helmet looking good. To be honest, I'm perfectly happy with either Hunter. You did a great job on both. I have some tinkering in mind for the pink one's helmet, but I'll get there once I'm done with the rest. If I were able to freely add more images (see below), I'd gladly split the few lines of dialogue between both characters. I'm not interested in fan dubs, I've stated that on this thread before. Not interested in the LC tracks neither. Besides, different sized videos and audio tracks would add a layer of complexity to the patcher that I'd rather not have to deal with (let alone copyrighted assets). Maybe what you found is only used in X Challenge (maybe with a different pitch?). - "Player" adapts to whom you're playing as, and "Boss" adapts to the stage you're in, each with their own exceptions (ex. : Hidden stages also read if you're gonna fight Nightmare Zero/High Max/Dynamo. I haven't looked into the final stages, but there must be a similar check to go, for example, from Gate to Sigma's mugshot after you defeat Gate). - These are all read from their own files, except Alia (the only "static" one), which is read from the stage data instead (it's included in every single stage file. Weird). - Good news: Fortunately, the "corrupted Alia" mugshot seems to be an unused placeholder. If true. this would make things much easier. It would mean I'd already have room for my animation/sprite assembly data, and a system in place to access it without having to write my own exceptions. And one slot would be enough, considering the Hunters and Light are not loaded in the same stage. - Unresolved: where to actually insert the new graphics. The obvious choice for me was to expand the Alia files in each stage (using "Hunters" in the intro stage, "Light" in the others), which seemed to work at first (the game would seemingly adapt to this file being bigger with no issues). However, in-game, the game is coded to only load this file in memory up to it's original size (well, the original size + 4kb, but those last 4kb, when filled, seemed to be replacing something else. And even if it was working with no side effects, it's half the space I need for the whole mugshot). So now I need to either figure out how to load more of this file (while hopefully not breaking anything), or finding some other place to load them from. Okay, I needed to get into the groove of making graphics in this style, but I think I've finally nailed it. 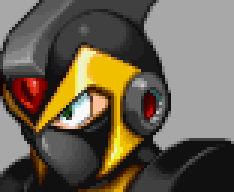 I also retouched the face again by bringing the left side of his left eye in one more pixel, and then reducing the size of his jaw one pixel. Now I think it blends in much better, and the battle damage works like it did for Iris' portrait in the X4 intro stage. If it's not desired, I do have a clean version of this portrait. By comparison, the old one's pin-headed, the shading's a bit boring, the chin's too long, and the eyes are a bit doofy. The gaping mouth doesn't really work well either. Also, a while back I tweaked the torso proportions to make it better centered and fit the other portraits better, and that's shown here too. That's fantastic! The added details really make a difference, makes the previous one look flat in comparison. You fixed the one niptick I had the previous one: volume on the front side of the helmet. The brim had no thickness on it's edge, but the darker purple you added to the borders gives it all the volume it needed. I really like how it turned out. Well, I haven't been able to spend as much time as I would've liked on this this past week, but I am making progress. After a chat with DarkSamus933, I finally found when and how each different mugshot is loaded, and why they're stored differently. I've got to the point where I can change the "boss" mugshot assigned to each stage. Now I need to be able to do the same with new files and not just the existing ones. These are from JPN X5. They're used at random when fully charged shots are fired. If you want, I could take a jab at rewriting some of the dialogue and story to be a bit better (I tend to rewrite what's already there instead of re-translating because I can't read Japanese it's more unique in a sense). Here's my rewrite of the Isoc intro scene as an example (used the X6 Script from the wiki as a base). Isoc: Attention, all surviving Reploids: It appears that, from my research, a new threat arises. It appears to be a corrupted virus from the Eurasia colony's remnants. It causes Reploids to hallucinate and feel dangers that don't exist... I've dubbed it "Nightmare". This "Nightmare" screws with a Reploid's programming, causing internal damage. The "Nightmare" then creates false images to relate this pain with, causing paranoia. 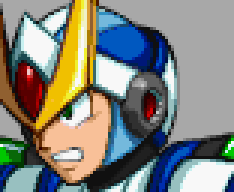 Because of the Colony incident, there are few Reploids and lifeforms left on the Earth... We must not allow sacrifices any longer! This would worsen the crisis as is. As a form of precaution, we have sent 8 investigator teams to various key areas to solve the mystery of this Nightmare phenomenon. So far, it appears that the Nightmare phenomenon is caused by Zero's remnants, formed into a virus-like ghost by the Colony. X: What?!? What are you talking about! Alia: Wait, X: let him finish his speech. Isoc: Now, I'd like to gather volunteers. Unite with us, and help rid of the Nightmare by working in any of our eight teams. Our goal is to eradicate the Nightmare, and to delete this "virus ghost of Zero". Let us unite for a better future! High Max will be in charge of team organization and protocol. We will guarantee your safety if you join us. We all suffer since this crisis began, so let us end it once and for all! We await your response! X: The nerve! For him to talk to Zero like that... He gave his life to save us! Alia: It can't be helped now: we both saw the Nightmare too, and it was shaped just like Zero. We need to investigate what the Nightmare is as well, so for now, leave Isoc and High Max alone. X: I wonder what are those "various key areas" he mentioned. Any info, Alia? Alia: I can target them, but due to a strong jamming, I can't analyze them at all. X: So I have to go in blind then. Maybe I can experience the Nightmare directly. Besides, I'm suspicious of this "investigators" operation. Signas: "The Nightmare", huh... This all seems too risky, but we must minimize as much damage as possible by uncovering and defeating it. As Isoc already said, we cannot allow any more sacrifices to be made... X, return to the Hunter Base now! The script part is pretty much already covered, but thanks, I'll let you know if I need additional help. The text of the cutscenes and almost everything outside of stages is already inserted into the game, taken straight from DuoDynamo's translation. For the rest of the text, I'll take DuoDynamo's's script as a base and NectarHime's re edit as a secondary source. Formatting for insertion takes a non trivial amount of time and work, so this is one part of the hack where I just had to stick to a single source early on, or it would be an endless back and forth of different people's edits re edits and interpretations. Firstly the shading just doesn't match 99% of the game's other portraits, since it's too detailed and soft. Plus the tone used for the armor parts is too blue. Also, certain details like the part above the gem and the V shaped crest aren't shaped right. Also, the torso is horribly misshapen and oversized, making his neck look sunken in, and the green gem on the left shoulder is rounded instead of flat. The original one wasn't too bad on its own; the black looks very glossy and that effect is well done, but that doesn't match the shading on the official art, or any other portrait in style. The gold has some shading issues, the trim at the top center of the helmet is a bit off in shape, and the gem is very wrong, as it's supposed to look like normal X's and a few other little things are off. The torso is also way too big looking again, as the artist seemed to have thought that the embossed areas on the chest armor were his shoulder pads. With both of these I tried my best to match the official art. 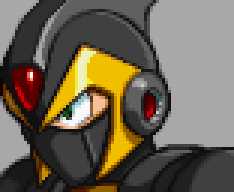 I also have cleaned up and corrected unarmored X's portrait, but I'll post that at a later date. I'll probably edit it into this post tomorrow or the next day if no other posts are made. I wasn't planning on editing more than was obviously missing (or in the case of the Ultimate Armor's mugshot, obviously off-putting), but I'm very happy you went ahead and did these too. Indeed, those ugly soft gradients needed to go. Will they work like this? I was actually just in the process of overhauling Light. This one here is basically done, but I might do a couple of tiny tweaks at a later date. 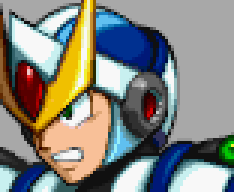 I tried to make him mesh with X6's art style, so for reference of the facial details I looked at Suetsugu's art of Double and Douglas, who have very similar faces to Dr. Light. 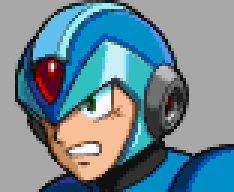 I wanted it to match the PSX X games's style, and I think I achieved it, and I also tweaked the shading to match the other portraits, and the palette was made to match the Light hologram sprite's palette. The GIF is a slightly earlier version, but whatever. 1. Those sprites look amazing, Metalwario. It really does look like official sprites from the game, I'm impressed. 2. I think I asked this as my first post on here, but I never got a response so I'll ask it again: I was curious if splitting Gate's Lab Part 2 into 2 stages would be possible, since part of the reason why the stage is loathed is because it's 2 obnoxious stages with an obnoxious boss in-between them. I feel like splitting them both into two proper stages would be a good way to balance it. Of course, this does sound like a lot of work, so I'm unsure if it's even possible to pull off. 3. A minor nitpick of mine is that you can't really exit the sub-stages normally (the ones within those crystal-like portals), even if you already have beaten it or the stage it resides in. I was wondering if you could make it work there. 4. You've all done a great job. Keep up the good work. 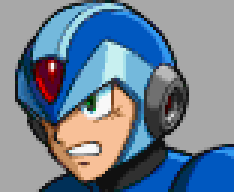 I fixed the eyes a bit, since in the original sprite it looks like X had one eye and lived in constant fear. I also fixed the torso since it looked a bit weird. Obviously, Metalwario is just gonna blow me out of the water with his take on it, but I had time to kill, so I thought "why not?". Besides, I like contributing to this thread, it's fun. The original is a bit of a mess. The colors are strange with the dark blue being too light (and having the right shade of blue as an odd border in those areas, which makes no sense), and the light blue around the face being green tinted, but the embossed stripe on the top being the right color, and there are lots of strange artifacts all around the edges, even in the light shine in the greenish trim of the helmet. Also, the original has a strange eye which is too small and makes him look either drugged up, or terrified. I enlarged it to match the artwork and the rest of the portraits, and I also smoothed out all of the above mentioned defects and oddities. The light blue color was made to be accurate and to be one unified hue, as well as cleaning up the strange artifacts on the edges. 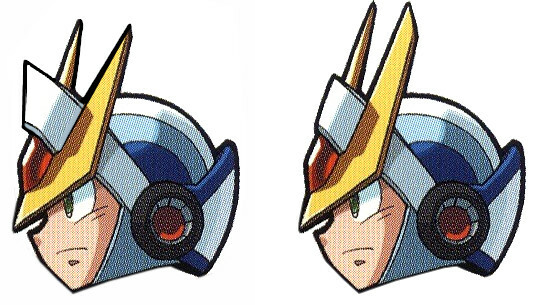 One of the artifacts in the dark blue part of the helmet was shaped like a highlight, and the artwork has them so I turned it into one, as well as continuing it along the torso and shoulder, to match the official art. since part of the reason why the stage is loathed is because it's 2 obnoxious stages with an obnoxious boss in-between them. Seems to me like it would only make it easier, not necessarily better. Having stages in a row is a common trope on this kind of game, I don't have a problem with it. I suppose it's possible to have the hidden stages be exitable only if the main stage has been beaten. It would need some recoding to make the connection (internally, hidden stages are entirely separate stages), but it might be worth checking out eventually. Also thanks Dannyplays. I think we all agree on the shape issues you addressed, though there were also issues with coloring/lighting which Metalwario covered nicely. I've heard this before a couple times. Actually watched this review the other day where it's brought up: https://youtu.be/6S71Vjj34O4?t=2613 (43m30s if it doesn't properly autostart there). I think it's less of a problem for returning players, though, let's be fair, vanilla X6 isn't exactly a game most players WANT to return to. I kind of agree with the notion even though it never particularly bothered me, just because I don't think High Max is a satisfying fight whether you know what you're doing or not/skilled or not, and, as usual for X6, neither are both halves of the stage itself. I think that's the underlying problem. If High Max and the stages weren't obnoxious, it could actually feel like a fair/fun challenge to not be able to save in between. Kind of like X4's Final Weapon 2-parter, though those stages are both pretty easy... At least Tweaks can already help with the High Max fight, too. 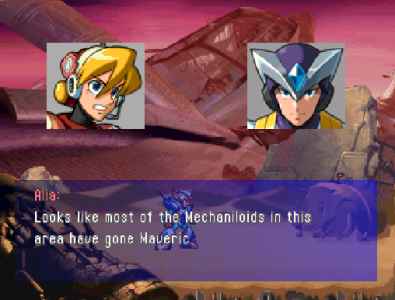 Of course, I know editing stages is an entire different can of worms, and I figure Maverick AI is a can of grenades. But sadly, I can't imagine the band-aid fix would be much easier. Either splitting the level up and assinging a new ID, or adding some weird level checkpoint saving feature, and a respective reading feature when starting the level to use that checkpoint/spawnpoint instead. But that's just all my wild guessing. And cool about mugshot progress! Going to be awesome if all that stuff can be added/fixed up! EDIT: Oh yeah, I forgot, it's also the whole "First half of the level screams use Shadow Armor, second half is impossible with it unless using the right parts" thing. Also less of an issue with various X6 Tweaks options, but terrible stage design is the root problem. Well, it's still a very common consensus that the whole Gate's Lab segment is poorly designed, so finding a way to make that thing less hectic is a plus in my book. The whole issue with Gat's Lab is that it's hard for unfair reasons, so in this scenario, easier does kind of mean better. Also, whoops, I forgot you added that. I thought that because it's a Complete-only thing, it would probably be a good idea to see if there are any issues with the Exit in the Light version as well. But yeah, it's probably contradictory to put that in the Complete version. I'm glad to help on any issues present, and good job breaking through those mugshots. It seems all is well right now. As for any issues that I recall from X6, I was wondering if the Dash Cancel Slash or Guard Shield glitches from Zero have been fixed in any way. Although I feel like you should focus on one thing at a time, so it's probably better to focus on the mugshot thing first and then focus on bug fixes. Again, good work so far.